Goodness, it has been months since I posted anything in this section. Of course, I haven't done a lot of crafting this year. I did finish quilting the Scrappy 36 Patch a couple of weeks ago. I finished the binding last week and it is now on our bed. Sure is colorful. Here is a little different view. It is too big to get a good picture of it and has been too windy for Kevin to hold it up for me outside. This is the best I can do. 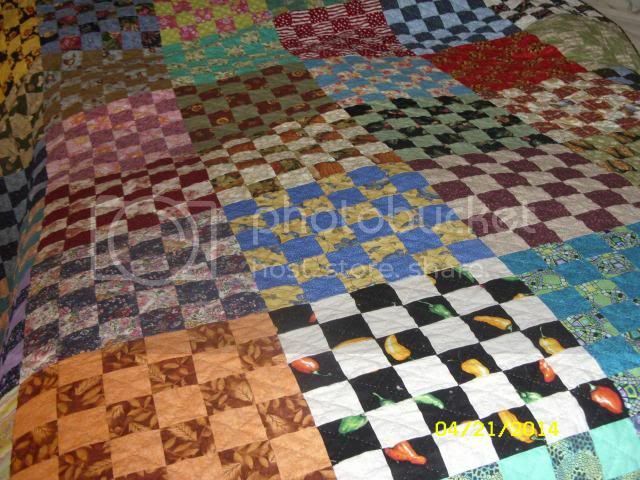 I hand quilted X's in each of these little squares. The quilting doesn't really show up, but I can feel the texture when I run my hands over it. It is nice and comfortable to sleep under. Re: My Scrappy 36 Patch is on the Bed! I can see the hand quilting! Lovely! That must have taken a long time to do! I just finished my 2nd quilt last night. I tied it instead of having it machine quilted (to save money!) and it took a while.. I kind of lost interest so I can see the value of having a few projects going at a time. I did the whole thing by myself though so I am pretty pleased. 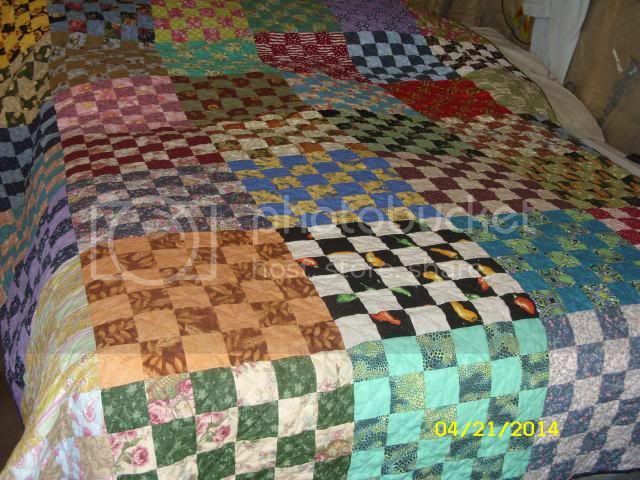 I love seeing your quilt, Winona.. they are always beautiful! Wow!! You have been busy!! Beautiful as always. Love the one for your aunt too! Great job, Winona! I like all the colors! It is so pretty , Winona! Love all the colors. WOW!!! I don't know why I am surprised, you are so, so talented. I love seeing the photos of your work!